Our upper control arms are built to the same exact standards as our lower control arms. 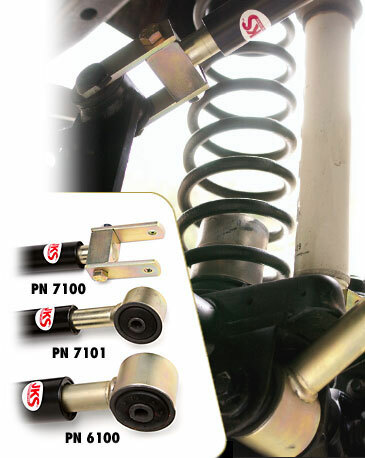 Again, with over 3 inches of adjustment in pinion angle, our control arms can be fine tuned quickly and easily. Factory OEM style rubber bushings are used at each end. The front upper control arms utilize an exclusive modular design only available from JKS. The design is far superior in strength than anything else on the market, yet can be completely disassembled. Our upper control arms as well as our lower control arms can be rebuilt with simple hand tools if required. Front upper arms shown at left in photo.